In a memorable 2012 NHL Draft that saw a record-tying 13 defensemen taken in the first round (including eight of the top 10 picks), two forwards also made history. And the coach who watched them play last season sees big things for both -- even if it potentially comes at the expense of his own team. With Sarnia Sting teammates Nail Yakupov and Alex Galchenyuk selected first by Edmonton and third by Montreal respectively, it marked the first time teammates had been selected in the top three since the Sedin brothers were taken second and third in 1999. The last time two Canadian junior teammates were taken in the top three at the draft was 1974, when Wilf Paiement and Richard Hampton of the St. Catherines Black Hawks were drafted by the Kansas City Scouts and California Seals, respectively. 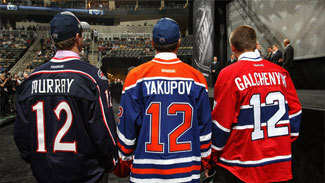 "We had a pretty good indication that Yaky [Yakupov] was going to go No. 1. Gally [Galchenyuk], we didn't know. But we knew that Montreal liked him a lot," said Jacques Beaulieu, the Sarnia coach and general manager who coached both players last season. "It's been hectic for the organization, but also positive." In his first season behind the Sting bench, Beaulieu was forced to contend without Galchenyuk, who was limited to two regular-season games after tearing his ACL in the preseason, while Yakupov finished 30th in Ontario Hockey League scoring, missing 26 games with an upper-body injury. The two players combined for an astonishing 184 points as 16-year-olds the previous season, and when Beaulieu took over the club last May, it didn't take him long to realize the embarrassment of riches he had up front. "Both of them are very special. They're very skilled, but they're just good at everything," he said. "They're going to help teams in the National Hockey League win a lot of hockey games." It might not be long before Yakupov and Galchenyuk make good on Beaulieu's prediction. Each player signed his entry-level contract this week and could potentially be skating in the NHL sooner rather than later. "Yakupov is definitely ready to play in the National Hockey League. There's no doubt. The only thing with Alex is he missed an entire season. I don't want to say he's not ready, but his skill level and his skating and hockey sense are at a pro level already," said Beaulieu, who was pleased to hear Galchenyuk express his intentions to make the Montreal roster as an 18-year-old. "I'm happy he said that. I wish him all the best and I hope he does make that hockey team. If he doesn't, he's going to play a lot of hockey for us and help us win hockey games." That's high praise coming from a coach who has made his bones in junior hockey developing defensemen instead of forwards. Over his junior coaching career, Beaulieu has worked with future NHL blueliners Dan Girardi, Marc Methot and Kyle Quincey. Also, his son Nathan is one of the Canadiens' top defensive prospects. But he's also worked with some superstar forwards, particularly as an assistant coach under Dale Hunter with the London Knights, where Beaulieu worked with future All-Stars Rick Nash and Corey Perry. "Corey Perry and Gally are alike, and I think Yaky and Rick Nash are alike. Both kids are game-breakers and can make a difference in a game," Beaulieu told NHL.com. "These guys are ready to go. It depends on the organization and their depth to see if they fit in or not."